This charity event with I put together with my sister and Jim NYTE HEET is TODAY!! At Retro bar Manchester! 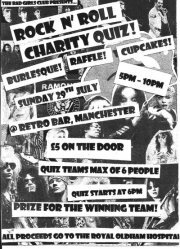 Rock N’ Roll Charity Quiz for Oldham Royal hospital cancer dept! A Rock n’ Roll quiz with Burlesque entertainment from Daria D’Beauvoix and Ebony Rose. Raffle with guest passes to NYTE HEET and Hell Bound in Heels up for grabs plus other cool prizes! Cup cake sale, fun quiz question rounds and interactive music rounds, prize and glory for quiz winners! Teams should be of no more than 6 and its £5 each on the door. Team names MUST be a fake tribute band name -so get thinking! Quiz will start at 6pm sharp! But get down for 5pm to get a seat! For a great charity- All money raised will go to Oldham Royal hospital cancer dept! !